Happy memories! Growing up in the eighties was great. 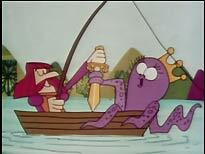 Serial cartoons were the thing to watch on Children’s BBC. 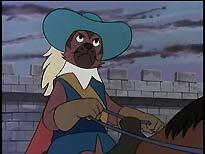 Dogtanian, Around the World with Willy Fogg , Ulysses 31 and The Mysterious Cities of Gold made for gripping viewing for a young boy. 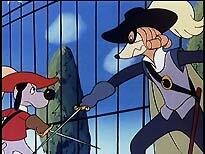 It was a toss up between Dogtanian and Mysterious cities as to which was the best of this peculiarly eighties genre. 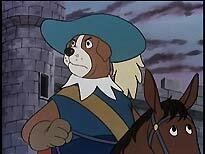 Though Mysterious Cities, for me, wins, Dogtanian comes a very honourable second. 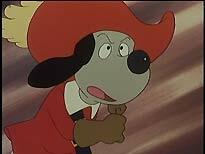 Dogtanian was an adaptation of Alexandre Dumas père’s 1844 novel The Three Musketeers. 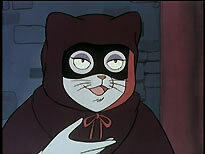 The series was commissioned in 1981 by a Spanish company, BRB International, and made by a Japanese animation company, Nippon International, where it was known as Wan wan san jushi. It was quickly translated into several languages, including Spanish and English, and sold to various countries. 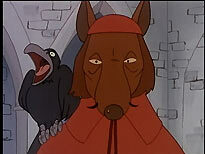 The English adaptation was first shown on BBC1 in 1985, and then repeated again a few years later. The serial was also given a screening on ITV a few years after that. 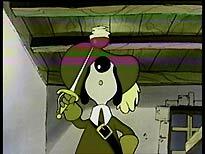 Told over twenty-six twenty-five minute episodes, it tells the story of Dogtanian, an impulsive young pup who also happens to be an expert swordsman. 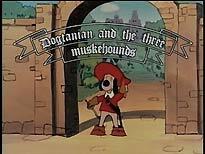 Dogtanian is sent to Paris to join the famous Musketeers (though they’re called the Muskehounds in the theme music and narration, they are always referred to as the Musketeers in dialogue. Weird!) There he meets up with the Three Musketeers (Athos, Porthos and Aramis), and gets involved with court intrigue amongst the French Royal family, and in Cardinal Richelieu‘s evil schemes to destroy the Musketeers and get more power for himself. The series is presented across four DVDs, which seem to be the same as those previously released separately. (This probably accounts for some of the differences between the house presentation style from disc to disc, and the odd way the episodes are split across the disc: the first disc contains nine episodes, disc two has six, disc three has five and disc four has six). The average bit rate on the first disc is 4.4Mb/sec, although on occasions it peaks at 7Mb/sec. Disc two averages a reasonably high 6.2Mb/sec, with the occasional dip to around 3Mb/sec. Disc three averages 4.47Mb/sec peaking at nearly 9Mb/sec, though it occasionally drops below 2Mb/sec as well. The bit rate software wouldn’t read disc four for some reason. The picture quality is good for the age of the material, though clearly no restoration has been carried out. There is evidence of film sparkle and the occasional scratch but nothing too big or too distracting. 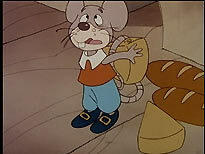 In episode five there are a couple of examples of colour banding, which could have been fixed with some restoration. (See third screen grab, above). The first of two examples appear during the opening credits. Since the credits don’t change from episode to episode there really is no excuse for not simply editing in the credits from another episode to replace the damaged section. Colours are good, though could be more vibrant. All in all the picture quality is perfectly adequate but could have been better with some restoration work done. The way the episodes are presented on the disc is slightly annoying. On the first disc the episodes are all encoded as one title with the counter not resetting at the beginning of each episode. The only chapter points come at the beginning of each episode. Things get slightly better from disc two onwards. On these discs each episode is encoded as a separate title, so the counter is not an issue (though for some reason the counter does not appear to work at all on disc four!) Each episode has only one chapter point which comes just before the “next episode” trailer shown directly before the end credits. Fine if you want to see this or jump (almost) straight to the closing credits but pretty useless other wise! A similar method was applied to Revelation’s early Tomorrow People discs, and it was equally confusing there. Sound is in its original mono, and is perfectly serviceable throughout. Episode one has a couple of sound holes (at 10’16” and 21’36”). These only last a second or so, and only the first actually happens during a piece of dialogue. The rest of the episodes are unaffected. Disc menus are functional and nice on the eye. Disc one has static, silent menus. Discs three to four have different menus, which include moving elements with the series theme tune playing over them. The packaging is interesting. Each disc has its own case but they are half the width of a normal Amaray case. (They’re the same type of case increasingly favoured in the US, for their multi-disc sets: the Hellboy Director’s Cut, for example). The cases themselves are rather flimsy. Two normal cases that hold two discs each would have been better. The four cases are held together by a wraparound sleeve akin to that used for the UFO box sets, though in this case the sleeve is made of plastic rather than cardboard, and so is sturdier. For a budget release the extras are reasonably good. Disc one includes a wealth of text extras including character profiles, the theme lyrics (including foreign language versions and their English translation) and a look at the differences between Dumas’ original novel and this adaptation (including noting the unfathomable swapping of Athos and Porthos' names!) They are quite interesting and help to pass five minutes. Disc two also had text-based extras, but these are the same as those on disc one, just presented in a slightly different manner! 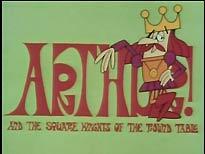 Disc three has only one extra, an episode of the series Arthur and the Square Knights of the Round Table, presumably included to promote Revelation’s DVD release of the series. Unfortunately it didn’t work for this viewer. If this episode is anything to go by then this is a dreadful little series with little character or style. 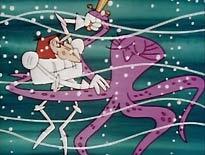 The animation is not up to much: very unimaginative and poorly executed (the fight between Lancelot and an octopus is a particularly bad piece of animation, done as a static shot with the characters moving in and out of shot). (See images below). Disc four’s only extra is a repeat of the character profiles seen on disc one. The set comes with a double-sided A3 poster, each side showing a collage of images from the series (or, more accurately, one from this series, and the other from its sequel). From the design, it looks like these a reproducing promotional posters for the series. It's a nice addition to the set, especially for kids of all ages! For those with happy memories of the series this set is well worth getting. It’s very reasonably priced, especially compared to the original RRP of the individual discs, and the set offers very good value for money. The story it is based on is a good one and this is an excellent adaptation of it that has aged well. Your childhood memories are unlikely to be diminished by reacquainting yourself with this little gem. Now if only someone would release Mysterious Cities of Gold (or at least version with the English soundtrack included!) my kids TV DVD collection would be complete!